X-SEED 4000: World’s tallest tower will house 1 million people | "Global Possibilities"
There’s a lot of debate about what the tallest tower in the world currently is. Some say the Taipei 101, at 1671 ft to the tip of it’s spire, is the world’s tallest tower, whereas we might argue that the Sears Tower, at a whopping 1731 ft (and 110 stories), still takes the prize. However, if the enormous, 13,000 ft X-Seed 4000 structure ever gets built in Tokyo – it will win the worlds-tallest-building competition hands down and leave its puny competitors in the dirt. Looking eerily like Mt. 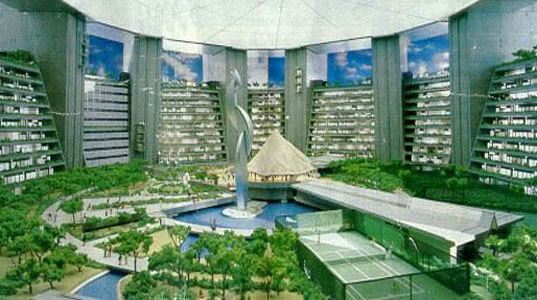 Doom in the above rendering, the mountain-like X-Seed 4000 represents a utopian eco-vision for a self-contained high-rise city in the Tokyo harbor – powered mainly by solar energy. Aesthetically inspired by nearby Mt. 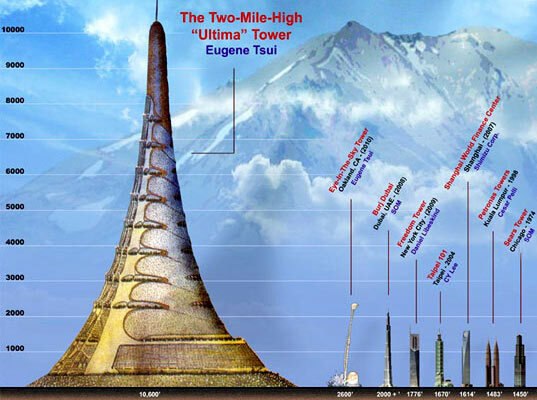 Fuji, the behemoth building would measure 13,123 feet tall with a 6 square-kilometer footprint, and could accommodate five hundred thousand to one million inhabitants. Designed by Taisei Construction Corporation as an “intelligent building,” the futuristically-named X-Seed 4000would maintain light, temperature, and air pressure in response to changing external weather conditions. Unlike conventional skyscrapers, the X-Seed 4000 would be required to actively protect its occupants from considerable air pressure gradations and weather fluctuations along its massive elevation. Its design calls for the use of solar power to maintain internal environmental conditions. Some estimate that the cost to construct the X-Seed 4000 structure may be somewhere between US$300-900 billion. We’re not saying it’s impossible, but for now, X-Seed 4000 seems like more of a utopian vision for contemporary green urban planning than a viable design solution.